When it comes to the industrial sector in Alberta oil and gas comes to mind for many. While it may be in the news more often than anything else our province is also bountiful in agricultural resources (the second largest generator of GDP). As one of the most important regions in the country in this capacity, farmers, manufacturers, and complementary businesses are looking ahead to a bright future (more on this statement below). If you own or manage an agricultural enterprise and are considering a new build to support your business you’ll want to read ahead. That’s right, agriculture equals big business in Alberta and will be even bigger in the near years ahead. While the overall budget for the year was recently reduced, the Agricultural Minister deemed it status quo (given the past fiscal year) and much of this was due to an amalgamation of provincial boards and commissions that have already fulfilled their mandate. Otherwise, the province is throwing support in the direction of agriculture where innovation is concerned (more on this in item #3 below). The federal government is also making strides towards the protection of farmer’s interests, with recent news that they are considering an extension of provisions dictated within Bill C-30, an act that seeks to optimize the rail movement of Alberta crops. And then there is non-governmental interest. Private investment is stimulating agriculture in Alberta, especially in the grain handling industry, where construction is underway on 10 concrete grain elevators (shared between Alberta and Saskatchewan). Canadian private equity firm from Toronto, Area One Farms (visit areaonefarms.ca to learn more) is also investing heavily in Alberta. When you witness this kind of interest from the private sector, you know things are looking up. Support is also coming in the form of technological initiatives that will increase energy efficiency (and reduce dependency on oil and gas) in agricultural operations. The On-Farm Solar Management Program is set to open its budget later this year to provide both provincial and federal funding for solar energy initiatives on Alberta farms. The province has also declared rebates to farms that set up solar power. Advancements in existing forms of agricultural construction continue. Pre-engineered steel buildings are being adopted as the most efficient means of delivering an agricultural build. The design-build methodology is also being embraced quickly by agricultural interests looking to skirt the construction workload so that they can focus on their business prospects. Construction project management systems in Alberta have become more efficient and scalable, leading to a more cost-effective build with a greater turnaround time. 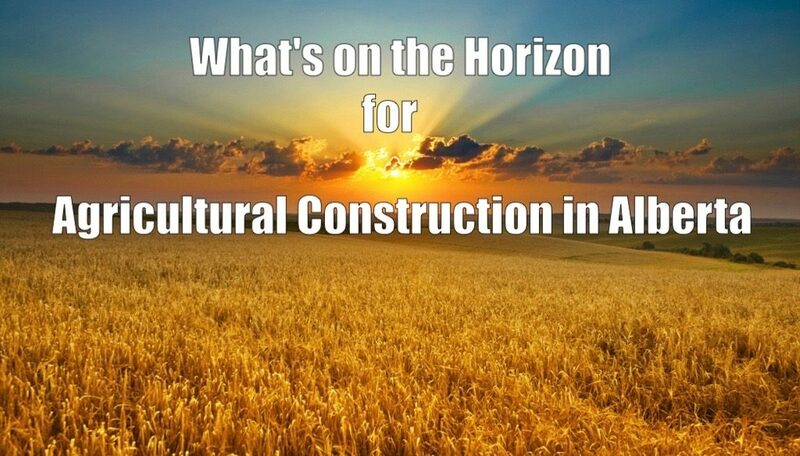 There has nary been a better time (in recent memory) to begin your agricultural-driven construction project. If you’re building in the Central Alberta area, contact Apple Building Systems Inc at 403.340.6777 anytime, to learn more.